The Ricoh Group has set fundamental principles on social contribution by which all Group companies around the world abide. We believe that by conducting social contribution activities based on a common concept, we can maximize the effects of our contributions toward solving challenges. Under these principles, individual Group companies are implementing measures by leveraging the Group’s strengths human and other resources. Reflecting a deep understanding of social issues in various parts of the world, our group companies carry out social activities focusing on several priority areas. Engage in activities that contribute to the local community. Foster a corporate ethos that places importance on contributions to society. 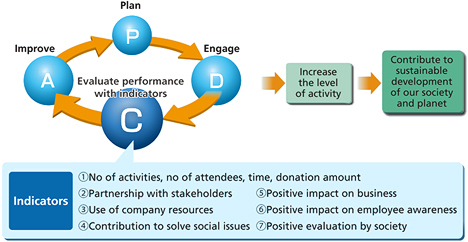 To best solve social issues, we maximize the efficiency of each activity around the world through the PDCA cycle and common group indicators. By knowledge sharing and horizontal development, we strive for consistency among group companies.